Sometimes I'm really struck by how awesome my dog really is. And not only that, but by how much the training we've done with her has helped her with her confidence level. Today I took her out to the park for a Halloween photo shoot. I had big plans for this one, much more than just a costume. I was inspired by the purchase of a pair of Doggles (goggles for dogs, if you're wondering what they are) and the video of Weird Al Yankovic's Dare to be Stupid (which you can see here). 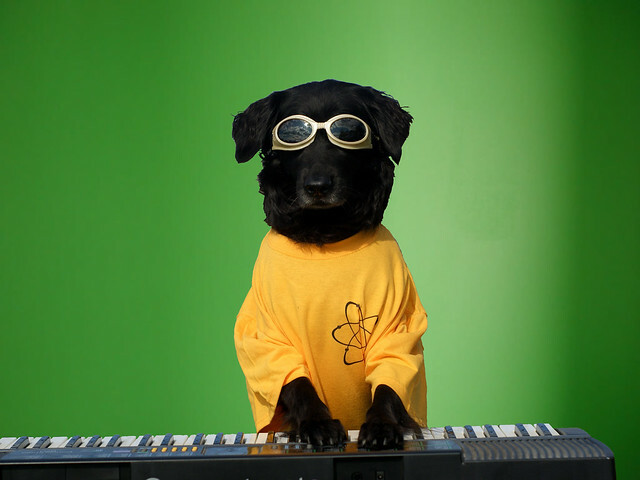 The idea required that Dahlia stand up with her paws on a keyboard while wearing a yellow t-shirt with the atomic symbol on it and a pair of Doggles. Yikes! 1. Standing with her feet on a park bench. 2. Standing with her feet on the keyboard which was sitting on the park bench. 3. Doing #2 while wearing the t-shirt. 4. Doing #2 while wearing the t-shirt and the Doggles. For each one I also worked on getting her to hold the position long enough for me to take photos. In the end, this was what I ended up with*. All of this was accomplished in less than a half an hour! She's such an amazing dog! *Green screen edited in after the fact.